½ cup candy coated chocolate pieces. Preheat oven to 350°F. Prepare brownie mix as directed. Spoon batter into lightly greased, 12-inch pizza pan. Bake 23-27 minutes. Place peanut butter and sweetened condensed milk in medium saucepan. Stir over low heat until mixture is smooth. 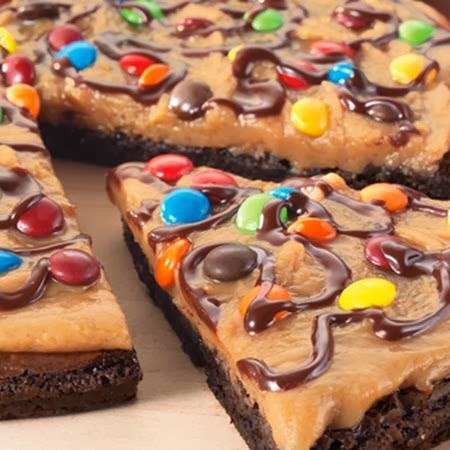 Spread over prepared brownie pizza. Melt chocolate chips and drizzle over peanut butter topping layer. Top with candy coated chocolate pieces.